Big day today!!! I have for you a delish, comforting, please all recipe, a super fab giveaway and my weekly recap!! So let’s get the ball rolling and let me show you what I woke up to this morning!! Yah baby! This is my Apple and Cinnamon Overnight Oatmeal. It is amazing! It’s creamy, filling and so darn delicious! My Husband actually asked me for a bowl of it this morning. After all who can resist the smell of apples and cinnamon when you wake up? You have to remember this is a big deal, since my Husband never eats breakfast!!! I made this overnight oatmeal in my new Crock-Pot® Create-A-Crock™ slow cooker! I am so loving my new funky design, check it out! I went to the Crock-Pot® Create-A-Crock™ slow cooker and they now have a design your own Crockpot, called Create-A-Crock! You can even add photos to it! I skipped out on adding the photos because I couldn’t decide what I wanted. I spent days trying to decide and I opted for skipping on the photos! It would make a great Christmas gift for Grandma, by putting pictures of the grand kids or in my case my grand dogs on it. Or create a football themed crockpot and add photos of your Husband or Kids at the big game! Bring it out during football season! Your Hubby’s friends would get a kick out of it. Totally cool!! I am loving my funky pink circles! It’s so me!!! To make my overnight oatmeal, all I did was add some steelcut oats, water, apples, vanilla and a pinch of cinnamon to a bowl that fit inside my crockpot, filled the outside of the bowl with water and went to bed. Eight hours later I had creamy, hot delicious breakfast waiting for me. When I saw the weather last night they said high 48 and I knew it would be hard to get out of bed, yet stand in my cold kitchen and make breakfast. Not today I didn’t. I threw on my pink bathrobe, ran to the kitchen and grabbed me some hot comforting oats. I cozied up in front of the tv as I watched my cooking shows. Perfect morning!!! Here is the oatmeal before I turned on my new Crockpot. I didn’t add any sugar to my oats because my family has all different kinds of taste when it comes to oatmeal. My Husband loves lots and lots of brown sugar, Little Jenny likes little sugar and me, I like maple syrup with a dollop of peanut butter! Amazing and healthy too!! Here are the oats fresh out of the Crockpot. Just look how creamy and delicious it looks! This makes for a wonderful, filling breakfast for a school or workday morning. No fuss no mess!!! I chose this method of placing the oats in a separate bowl, because I didn’t want it to burn and I knew I wanted 8 hours of sleep so I wouldn’t have to wake-up and worry about burnt oatmeal. There is no way I would want to scrub that in the morning!!! If you have leftover oatmeal, you can always refrigerate it for a few days and heat it up in the microwave. Unfortunately we do not have any leftovers, so I will be making it again this week!! 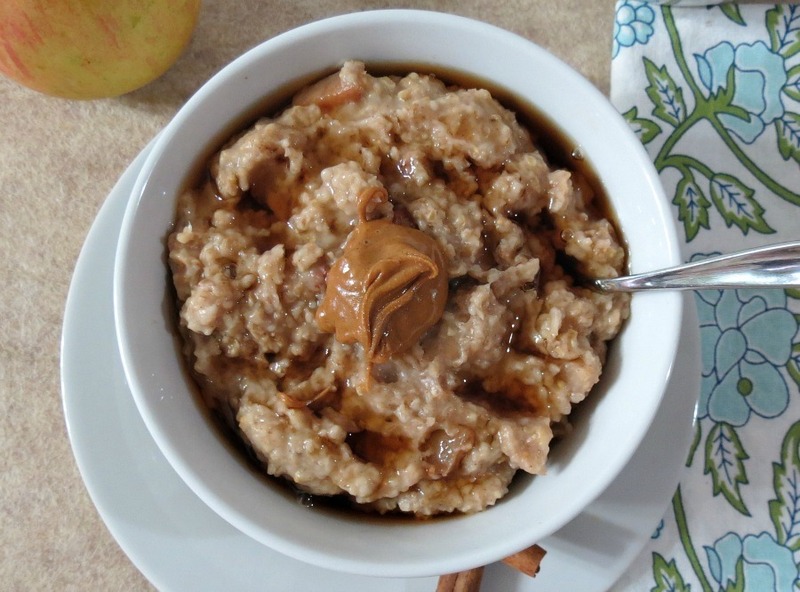 A hearty thick bowl of steelcut oats made with apples and cinnamon and slow cooked in the crockpot. In a bowl that will fit in your crockpot, add all of your ingredients and stir. Place the bowl in the crockpot and than fill the crockpot with water until the water comes up at least half way of the inner bowl. Set the your crockpot on low for 6 - 8 hours. Serve with brown sugar, maple syrup or nuts. Ready for the giveaway? 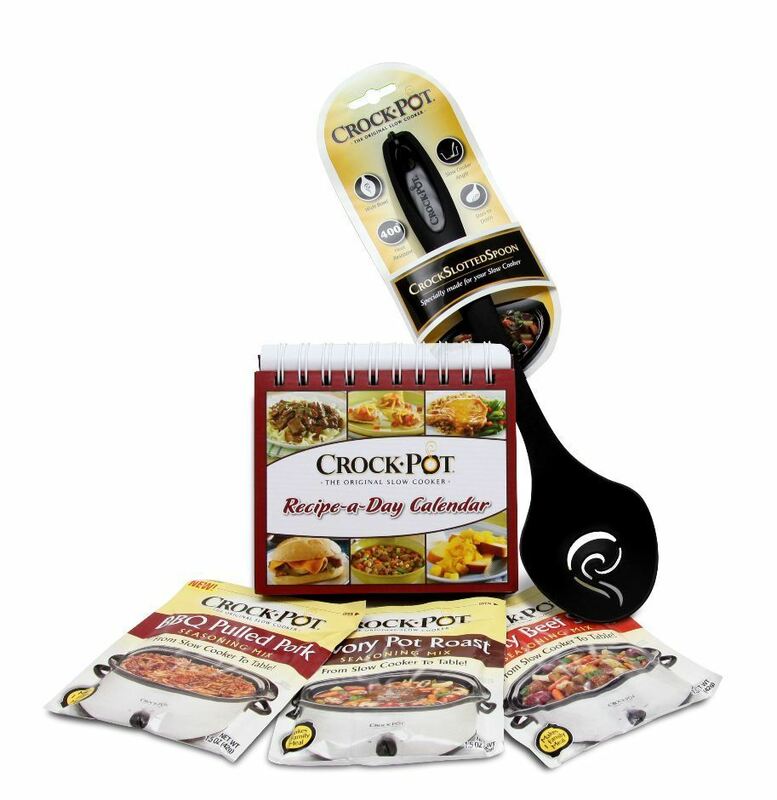 Crock-Pot® Create-A-Crock™ slow cooker is nice enough to let me give one of my readers a Crock-Pot Calendar Cookbook, three Crock-Pot seasoning mixes and a Crock-Pot slotted spoon. To win this fabulous little gift pack all you have to do is answer this question: On the Create a Crockpot Website what design would you get? Lots of choices from football teams to stripes, polk-a dots and Zebra and more. Just go to Crock-Pot® Create-A-Crock™ website here. I’ll pick a winner on Wednesday, December 19th and post the winner on Thursday’s blog. 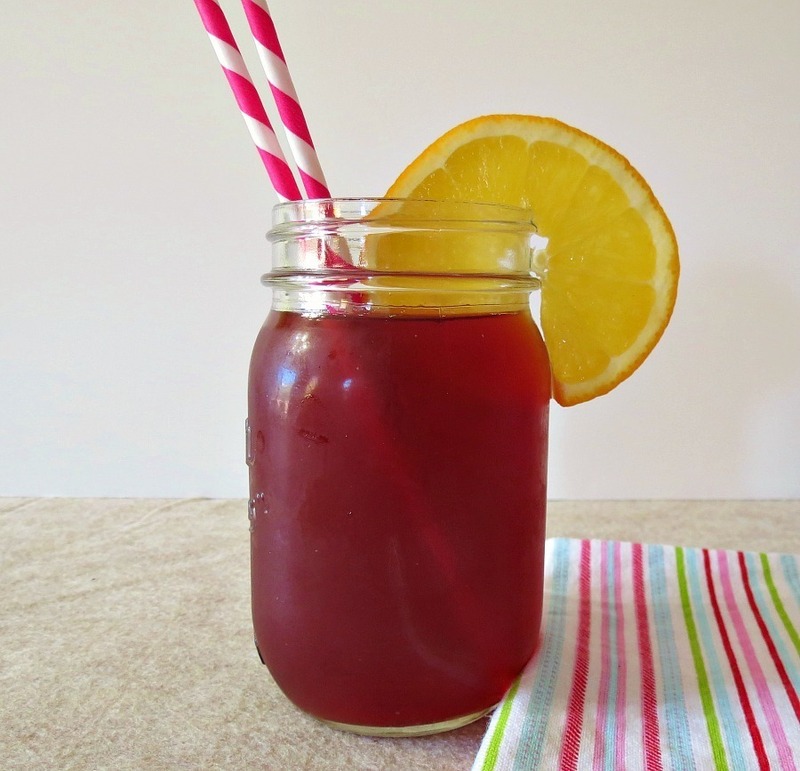 Monday: Pomegranate Citrus Juice – This is so refreshing!! My family just loved it!!! The combination of pomegranates and oranges is wonderful together! 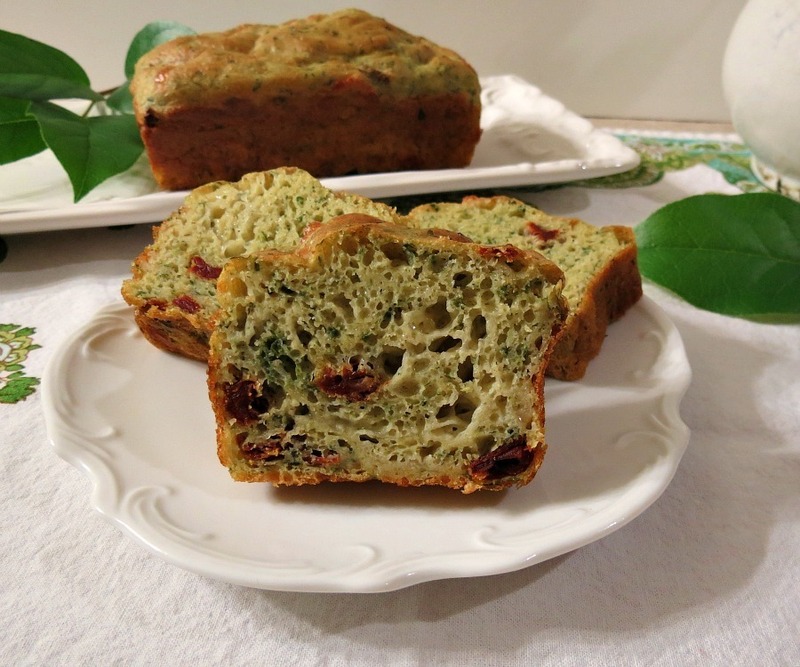 Tuesday: Sundried Tomato and Pesto Quick Bread – Loving this bread! So good with soup and pasta and it’s healthy too!!! 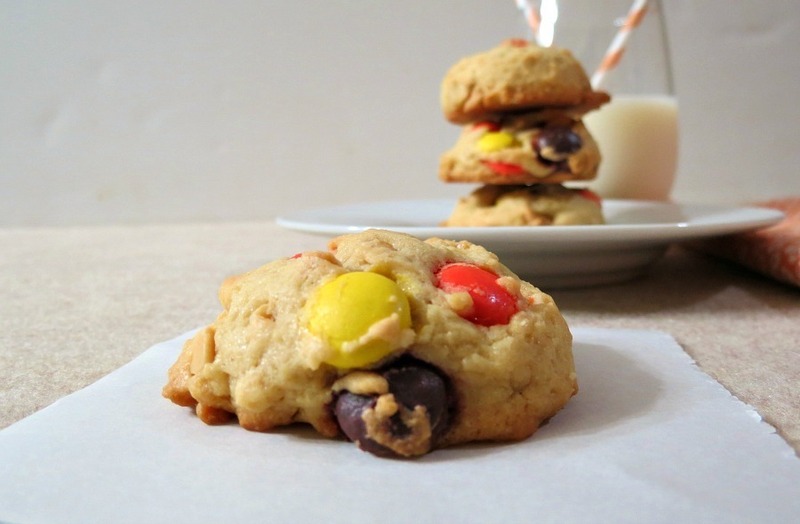 Wednesday: Reese’s Monster Cookies – I love these cookies! I gave them away for the Great Food Blogger Cookie Swap. A thick cookie Reese’s Piece’s and Peanut Butter Chips. 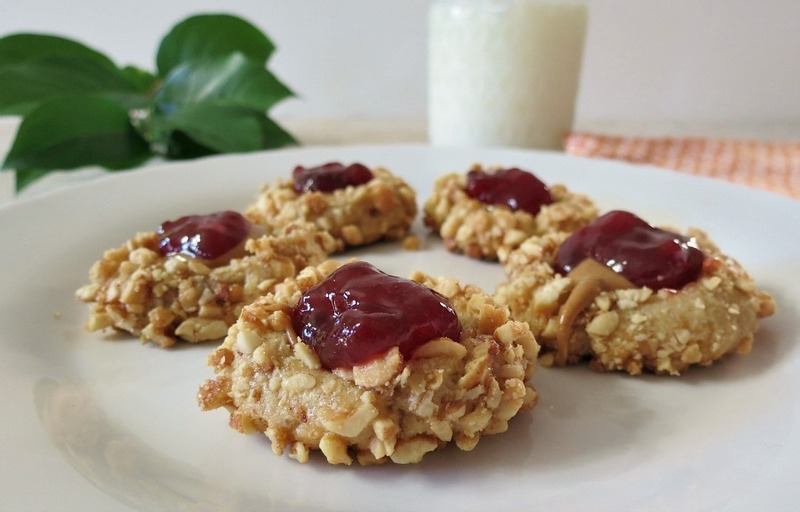 Thursday: Peanut Butter and Jelly Thumbprints – Oh my!! A perfect replica of a Peanut Butter and Jelly sandwich!! This is one cookie that you can’t keep your hands out of the cookie jar!! 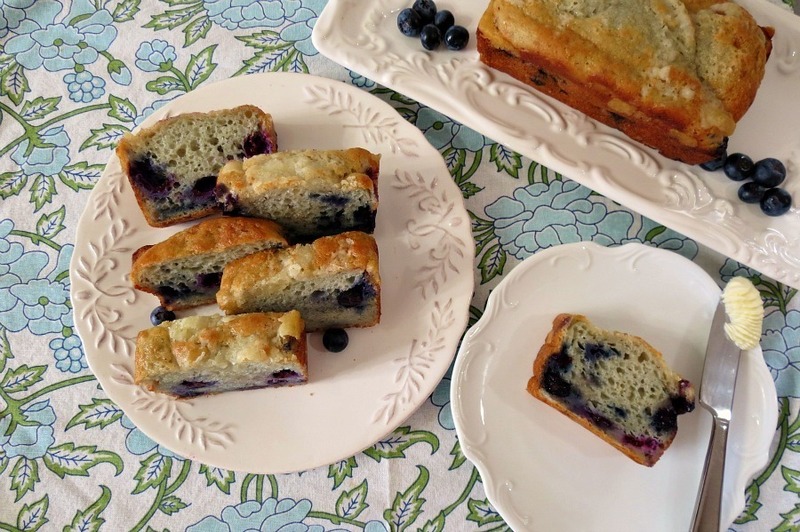 Friday: Blueberry Muffin Bread – This bread is a perfect match to the traditional Blueberry Muffin! It’s healthy and sweet!!! 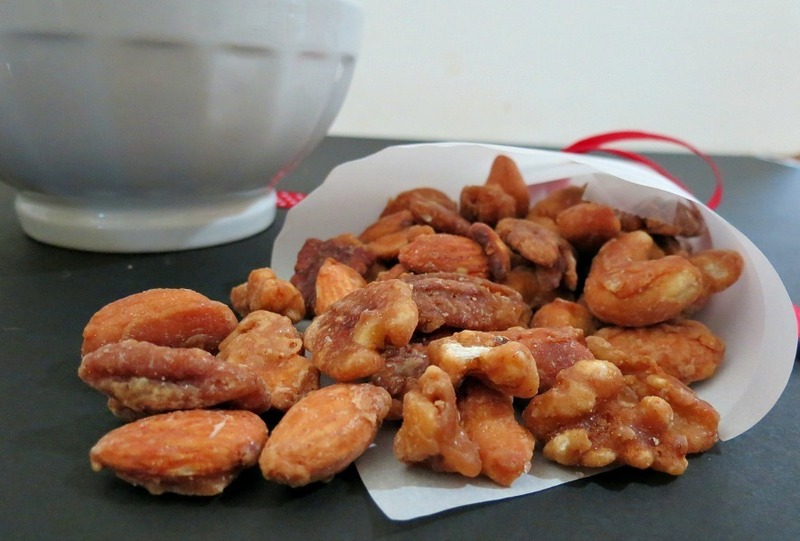 Saturday: Candied Nuts – Oh my gosh! I wish I never made these!! I want to give them as a gift but I ate so many of them, that I don’t have very many left! I guess I need to make more!! Don’t forget I posted the link to watch Santa feed the reindeer’s before his big day! Well my Friends! Time for me to make another Crock-Pot recipe! I am thinking soup!! My Husband has to go to the dentist so I have to make something that I know he can eat and is filling too!!! Loving my Crock-Pot!! Have a great Sunday! Don’t forget to enter the CrockPot Gift Pack Giveaway!!! P.S. 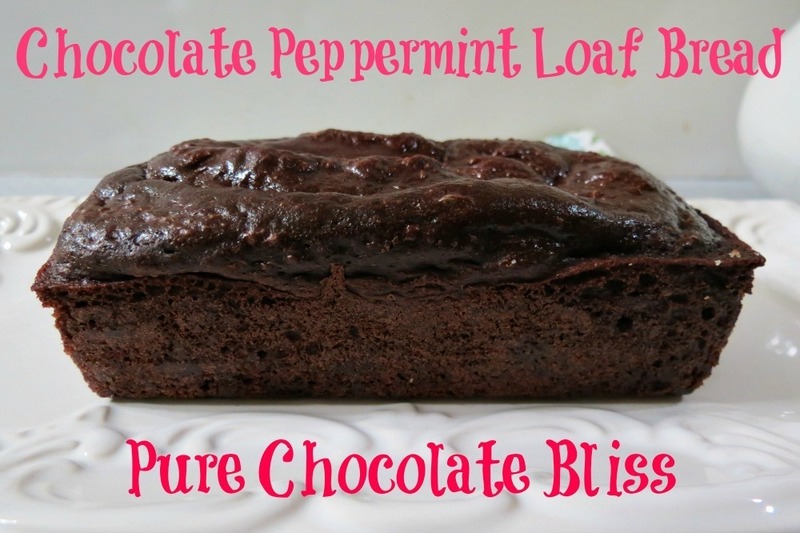 This weeks craving is Chocolate Peppermint Loaf Bread! I can’t get enough of peppermint and chocolate together! -However, I did share the givaway on FB! I would love to win a Pittsburgh Steelers crockpot! Thanks for such a fun giveaway! Go Steelers! I receive your emails! Look forward to reading them when the posts hits my inbox! I always look forward to your emails. You’ve given followers some great low-fat, low-sugar recipes! Great post. I’m watching cooking shows this morning too! I’m a big Packer fan so I’d definitely have to get a Green Bay Crock Pot. I follow you on email(g+) and I would choose the zebra stripe crockpot. I follow you on Pinterest. My choice is the 2.5 quart size in Paw Prints. I’ve been wanting a small one to go with my larger crock pot. The zebra stripe would be great. Great giveaway! I would love to have the Touch Screen Crock Pot – such a cool gadget, and would be a good upgrade from my current workhorse. Thanks for sharing, Jennifer! I would choose the beach theme for my custom crockpot. I also follow you on facebook and pinterest. I saw a yellow patterned on I really liked. I would choose purple dots. I love your recipes… I am going to make the oatmeal tonight! On the Create a Crockpot Website what design would you get? I’d get the Baby Owls design! I love that one! This is Dallas Cowboys country, so that’s my first choice! I follow you on Pinterest as Blue Strong! I follow you on Pinterest as katymiles77! Oh, and I picked the Beach design and add my pictures to it! I follow you on Facebook too! I picked the Beach design and add my own pictures to it! Jennifer, I love your crockpot, it’s the cutest i’ve EVER seen and I thick it totally fits your fun personality – it makes fabulous looking oatmeal too! Love love the crockpot. I would get a white smart cooker and put black design on it with black and white photos of my family. The meals you cook bring family together so it would be great to have your family on the cooker! I follow you on Pinterest and blog!! oh that is the cutest pink crockpot! And the oatmeal looks delicious. We have oatmeal almost every morning and I will definitely use your recipe! I’d choose the Crock-Pot Countdown Touch Screen Slow Cooker 6.5qt.! I follow Peanut Butter & Peppers on Facebook! Crock pot black damask, follow facebook pb & peppers, crock pot facebook, follow pintrest. I would love the zebra one! I really like the zebra print or the damask black. I would pick the New Orleans Saints print for the crock pot. I subscribe to emails, follow you on Twitter, tweeted the giveaway, and follow Peanut Butter and Peppers on FB. I would love the zebra stiped design. dont have a facebook, twitter or pintrest account. how do i enter the contest? They have so many cool designs that I just can’t decide right now. Probably b/c I have to much on my mind! Lol. On the create a crock pot site, I’d get the 2.5 quart with purple polkadots! Also following on pinterest, Facebook, liked crock on Facebook & pinned your yummy sounding apple cider pancakes! Oh- almost forgot, subscribed to your newsletter too! I’d LOVE a 49ers crockpot!